A cultivar of Fragaria chiloensis (L.) Mill. A low growing herb, the numerous 3-lobed leaves forming a basal rosette, spreading by stolons, flowers white, the edible fruits a rose-coloured berry, flesh white, the achenes (the seed-like fruits) evenly scattered over the surface. To 30cm. [RHSD, Hortus]. This is a white-fruited form. ‘Fruit large, irregularly ovate, sometimes roundish, having a tendency to form a neck, of a brownish colour towards the sun, the other side white. Seeds deeply embedded, with ridged intervals. Flesh soft, white, woolly, with a large core; flavour indifferent.’ [George Lindley – Orchard Guide p.487/1831]. Don considered it to be a worthless variety, ripening at the end of June and beginning of July. It was figured in Le Jardin Fruitier du Muséum [JFM vol.4/1861]. The illustration used here is from Pomona Britannicus, showing a red-fruited form at top right, but probably identical in all other ways. 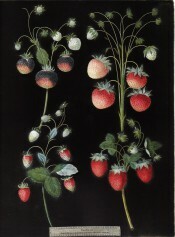 Listed in the 1845, 1850 and 1857 editions of the catalogue as ‘Large White Chilean’ [Strawberry no.4/1845]. 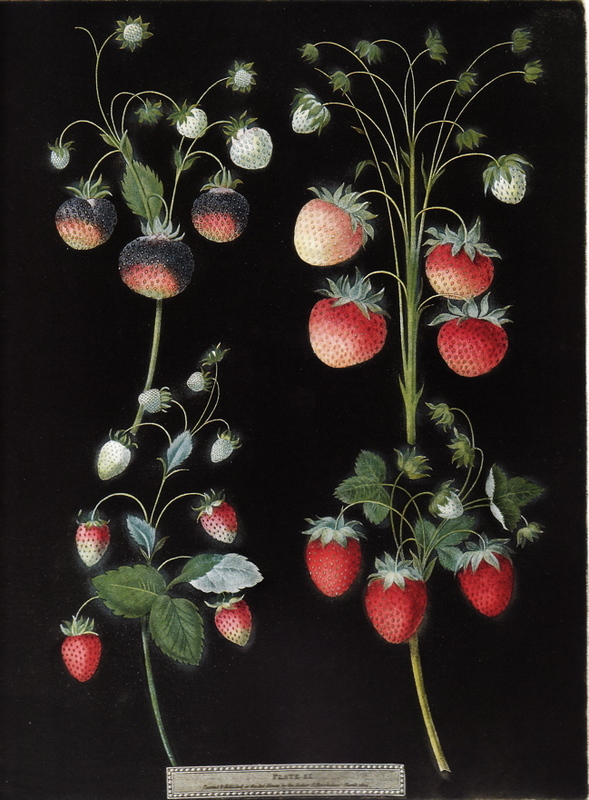 See Fragaria x ananassa Duchesne for the early history of the strawberry and background to this variety. Fragaria vesca L. f. semperflorens ‘Chilean Strawberry’ | PB pl.II/1812. 'Chili-Strawberry', the red-fruited form of the Chilean Strawberry is at top right.